Why stay with us ? A riad is a traditional Moroccan style of house, essentially planned around a central court yards with a water source such a fountain in the middle. Typically citrus trees are planted within the courtyard in a geometrical layout. Windows face inward and traditional architectural features such as arched door ways, ornate plaster and carved wood adorn the upper walls and ceilings. Often dazzling colours and patterned floor and wall tiles are used in a mesmerising manner to create an almost overwhelming feast for the eyes. A riad is more than just a building, usually a riad surprises the guest… Entering through a small door of an unimposing façade, a riad is often underestimated from the exterior. Once inside one easily forgets about the world outside and a harmonious, calming and inspiring feeling takes over…. 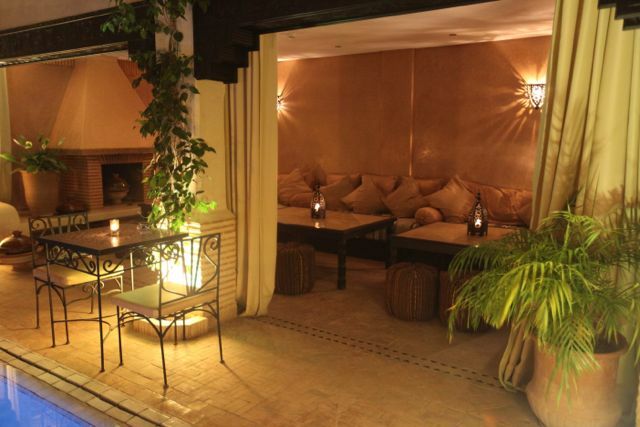 and herein lies the charm and allure of ‘’The Riad Experience’’ Many authentic riad homes, particularly in the medinas of Fes, Marrakech and Essaouira have been converted into guest houses. And due to their popularity, these days in Morocco the term ‘’riad’’ invokes the idea of a ‘’unique guest house’’ Many might say, a trip to Morocco is not complete without spending at least a few nights in a riad. Come and experience it for yourself! Our small friendly team greet you with a warm welcome and sincere wish for you to have a smooth and enjoyable stay. We’re here to assist you in making the most of your vacation; whether that be simply giving directions, organising activities, general advice or recommendations, just ask. Situated in a laid-back, hassle free village by the beach boasting great weather year-round. Base yourself here for an exotic surfing and beach holiday, with a choice of activities and interesting daytrips nearby to truly experience Morocco’s culture and hospitality ‘’Soussi’’ style. We are a unique property in the Agadir region. Offering an authentic riad experience you’d expect to find in the buzzing medinas of Marrakech or Essaouira. Quality new construction was completed in 2010. Traditional Moroccan craftsman details feature throughout the riad, giving a very natural and modern feel, while guest comfort is emphasized through well planned plumbing and electrical installations. At Riad Dar Haven, there is no need to sacrifice comfort for tradition, you can enjoy both in harmony. Quality bedding ensures a good nights sleep, so you’ll wake up fresh and truly well rested. Bathing is a pleasure in the freeform sculpted bathtubs especially with our scented artisan bath products. You will start your day with a satisfying breakfast then choose to simply chill out in one of the riad’s communal spaces or get active and explore. Surfing, yoga, golf, horse riding, camel riding, quad biking, beach and watersports, it’s all literally on our doorstep – you decide how much or how little to do each day. We pride ourselves on delivering good value and hope our guests feel at home and amongst friends during their stay. Many of our guests return and recommend Riad Dar Haven to their friends and family. This is the most rewarding part of our job and the biggest compliment.